We are Perlick appliance repair specialists. We work on both Perlick residential and commercial appliances. If you have a problem with you Perlick refrigerator, cooler, freezer or anything else, we can help. We repair and maintenance on all models of Perlick equipment. Our technicians are factory trained and certified by Perlick. We can fix your appliances fast and do an excellent job on it. After an appointment with us, you can be sure that your Perlick appliance will be fully functional and safe to use. 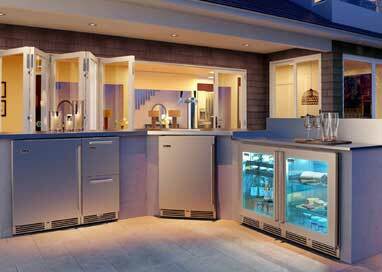 Perlick is known for its high-quality, handcrafted undercover refrigeration units for both indoor and outdoors. It services both residential and commercial customers. For example, bars, restaurants, arenas and large venues. Because it uses of high quality, industrial materials Perlick equipment can last you a very long time. But you need an experienced, certified appliance repair company to keep your appliances in top shape. Top Home Appliance Repair is such a company. We know everything there is to know about Perlick appliances. We order only high-quality Perlick parts, and we are up to date on all the Perlick innovations and new technology. If you want your equipment to be handled by top professionals, give us a call. Besides having outstanding skills when it comes to Perlick appliance repair, we also offer you some of the best customer services around. Our repair team is friendly and respectful. They will do whatever it takes to keep our clients satisfied. We offer you accurate estimate FREE service call with every repair job. Our scheduling is flexible. We can come to you on a weekend or after hours. Whatever is convenient for you will work. Also, we have a 3 yearwarranty on any parts that we install. When you hire us to do a project for you, you can be sure of the successful result. With our help, your broken, Perlick appliance will be fully functional again! Our company Top Home Appliance Repair has been doing residential and commercial appliance repair for more than 30 years. We are family owned and family company. We serve Los Angeles, Ventura County, Marin County and East Bay. Our services cover all major home appliances such as refrigerators, dishwashers, washers, dryers, stoves and ranges, ovens, steam ovens, microwaves, freezers, ice makers, BBQs, pizza ovens, patio heaters and much more. We can handle any project no matter how large or small it is. As long as we can find the parts for your appliance we can fix it. And usually, finding protest is not a problem for us. We have connections to all the parts manufacturers in the U.S. If you have a commercial establishment such as bar, restaurant, catering or large venue, you can rely on us. We do all Perlick appliance repair including commercial. We know how to handle our commercial clients without disturbing their customers or staff. Your business will not have to be put on hold while we do repairs. Give us a call and we will schedule repair appointment for you at your convenience. Our technician will preorder all the parts needed for this particular project. He will carry all those parts, tools and equipment with him when he comes to your house. Once there, our tech will start trouble shooting and will quickly determine what is wrong with your appliance. Whether it needs a simple tune up or complicated repair, we will do everything. Our certified technician will make sure your appliance is working again. After the work is complete, he will perform safety tests and hook your appliance back up. We value safety, and you can never be too safe when dealing with electricity and gas appliances. Then our technician will clean up after himself and dispose of all the old parts. Only then, will he turn the appliance over to you. You will be happily surprised at how fast we work and at what grat results we can achieve. We are simply number one when it comes to European appliance repair. Why choose us to do Perlick appliance repair for you? We have the most experience doing Perlick appliance repair! Our team is factory trained and certified. You can trust them to do the job right. We strive to keep our clients happy by doing the best work possible. We carry genuine Perlick parts an follow manufacturers guidelines in all of our repairs and service. Your broken appliance will be as good as new after we fix it. For Perlick appliance repair, please call us at 925-265-7782 in East Bay or 628-214-0064 in Marin County. Or you can fill out our short contact form. We would love to talk to you and answer all of your questions. Besides Perlick appliance repair are also certified to repair Asko, Bertazonni, Bosch, Dacor, DCS, Electrolux, Fisher&Paykel, Frigidaire, Jenn-Air, KitchenAid, Samsung, Siemens, Sub-Zero, Thermador, Traulsen, True, Viking, Whirlpool, Wolf. We are Perlick appliance repair specialists. We work on both Perlick residential and commercial appliances. If you have a problem with you Perlick refrigerator, cooler, freezer or anything else, we can help.